The iCNC XT enables fabricators to achieve the lowest cost per cut or best quality cut in all situations. The intelligence it brings to an integrated system is like having a plasma expert and production engineer inside the box, yet it offers experienced fabricators the flexibility to use their own cutting parameters and software programs. The iCNC XT from Victor® Thermal Dynamics®, a Victor Technologies brand, provides intelligent control for integrated automated plasma cutting systems and offers a suite of capabilities that optimize cut cost and boost operational efficiency. No other plasma control system can match the iCNC XT’s intelligence, simplicity, flexibility and cost savings potential. Using the iCNC XT can be as simple as entering the material type and thickness, then selecting the desired outcome on the touch screen interface: fastest cut for rapid cycle time or best cut quality so that parts can go straight to the next fabrication step with little or no post-cut surface preparation. Should skilled operators wish to fine-tune variables, they can easily modify them. The iCNC XT automatically sets and dynamically controls all process variables (e.g., current, voltage, gas pressure, torch height and torch motion). No plasma experience or nesting program skill is necessary to optimize cut quality, cut speed, cycle time and consumables life. As a result of building intelligence into the iCNC XT, companies can ensure that productivity, quality and profitability remain consistent across all tables and shifts regardless of labor and engineering resources. A Cost Calculator so accurate it can be used for job estimating, which can increase bid competitiveness and/or profit margins. Diameter PROä hole optimization technology, which sets cutting parameters to create “bolt-ready” holes or maintain cut quality on curves and radii. 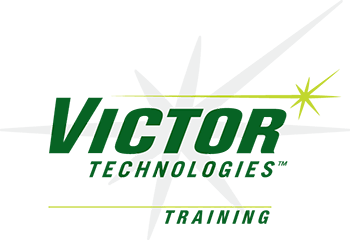 Only a Victor® Thermal Dynamics system using the Water Mist Secondary process can cut bolt-ready holes on non-ferrous materials as well. 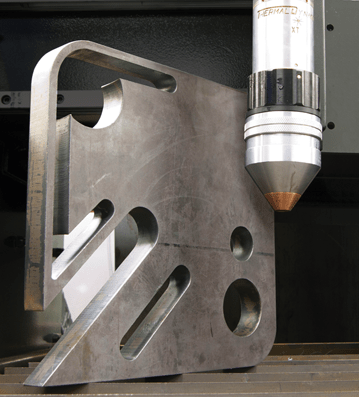 A Bridge Tool that assigns cut segments between parts to reduce the number of pierces and cycle time, producing a cost savings of up to 40%. Automatic nesting and plate editor tools that lower manufacturing costs by reducing plate waste and idle time. A micro-CAD tool and standard part shapes library that enable the operator to design and/or modify parts and cut paths right at the table; there is no need to go back to engineering, potentially saving hours of downtime. The iCNC XT can be set up to automatically optimize cutting variables and other settings for the job at hand. “The iCNC XT can achieve the desired quality without any input from the programmer or operator,” says J.P. Kinos, Vice President Brand Management, Automated Plasma, Victor Technologies. “The iCNC XT also provides advanced features which empower operators to optimize the cutting and nesting process after only a few hours of training,” states Kinos. 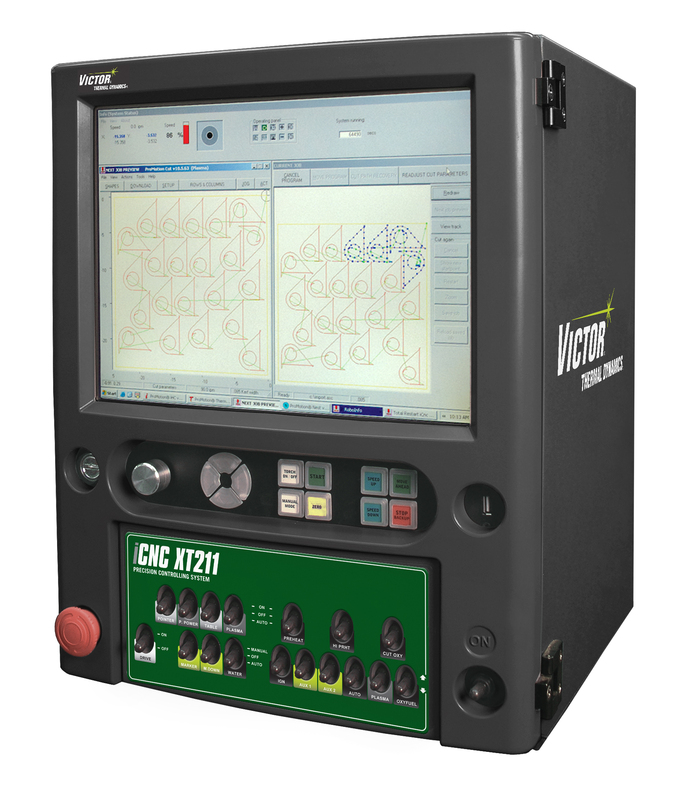 The iCNC XT incorporates a DXF converter so users can load part drawings directly to the controller, and it is also available as office software for use with any CNC cutting machine capable of reading ESSI or EIA cutting programs. Unlike other controllers that force users to adopt proprietary software, the iCNC XT also lets customers continue to use their existing office software and nesting programs, so there is no need to retrain employees. The iCNC XT incorporates dual microprocessors. One microprocessor provides real-time cutting control and enables operators to monitor a job in progress while the second microprocessor enables them to set up another cutting program in a second window. It also features internet-based remote control diagnostics, which enables the Victor Thermal Dynamics customer care team to take control of the iCNC XT and often troubleshoot problems in minutes. The iCNC XT can be specified with any new Victor® Thermal Dynamics® plasma system, installed as a retrofit and is available as a stand-alone CNC, with or without drives and servo motors. The CUTMASTER TRUE Series, combined with the well known performance and features of the industry-leading 1Torch, allows you to work all day at our recommended cut capacity but when you need that extra punch, you can be confident that it’s there – Always Delivering More Punch When You Need It. As a replacement (RPT) torch, the 1Torch has the ability to work on the majority of plasma power supplies on the market today. Its unique design allows the 1Torch the ability to work with high frequency, touch, CD, and moving parts (blow back) start systems.Converting to 1Torch can help you to lower your consumable parts inventories and operating costs. Only 34 consumables parts cover the full range of cutting and gouging needs up to 120 Amps. Inventorying parts for a fleet of plasma units can be simplified using the 1Torch. Fewer torches, fewer parts also means less time ordering and tracking inventory. It’s that time again! 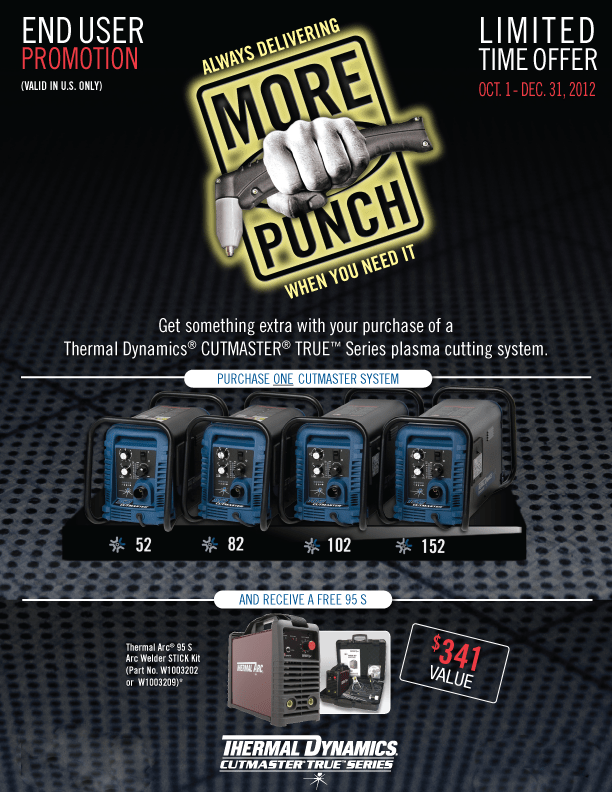 The Thermal Dynamics “More Punch With Plasma” end-user promotion is back beginning October 1st! This is a great time to finally get the plasma system you have been wanting! 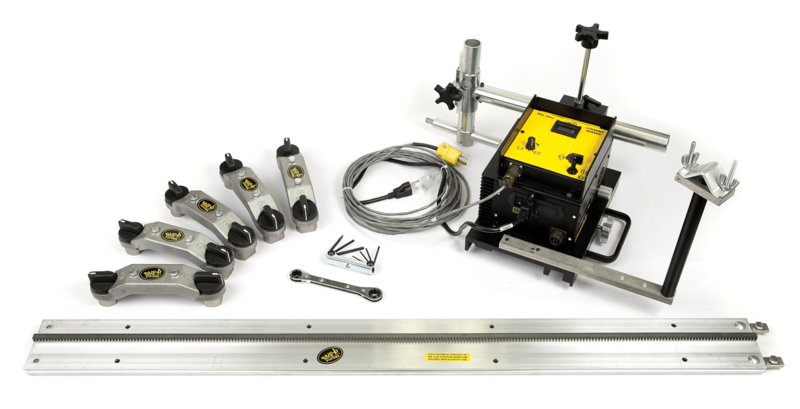 End-User customers who purchase a Thermal Dynamics® CUTMASTER® TRUE Series manual plasma cutting system between October 1 and December 31, 2012, can receive a free Thermal Arc 95 S Stick welding kit valued at $341. The offer applies to CUTMASTER 52, 82, 102 and 152 models. Redemption forms and instructions may be obtained on the Thermal Dynamic’s web site—HERE. 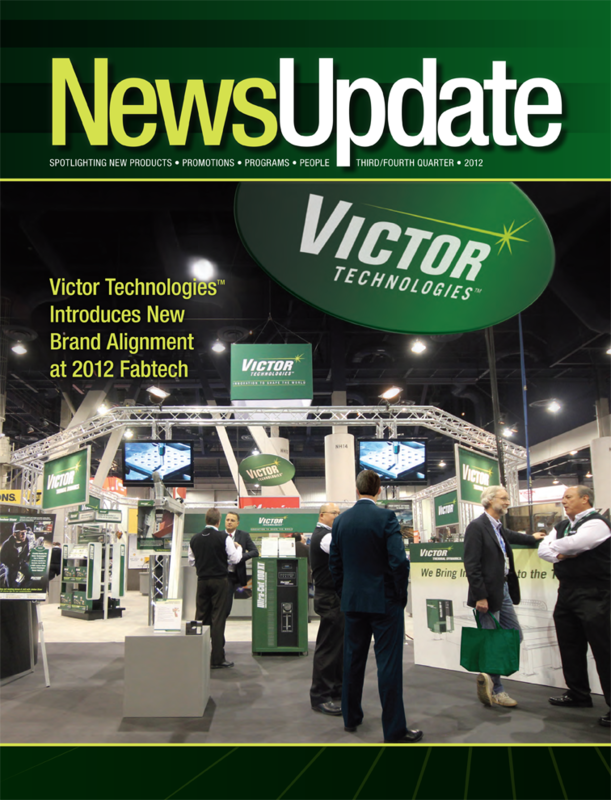 “The CUTMASTER family offers powerful and portable plasma cutting portability, so we wanted to thank our customers with a complimentary product and another additional processes that also offers portability, a Stick/TIG welder than weighs less than 10 pounds,” says Michelle Chamberlain, brand manager, Victor Technologies. Thermal Dynamics designed the CUTMASTER TRUE Series with the idea that the recommended cut capacity should also be the true cut capacity. A recommended cut will have a smooth cut face and minimal drag lines, dross and bevel, and the machine will have a 100% duty cycle rating at this output for uninterrupted cutting. 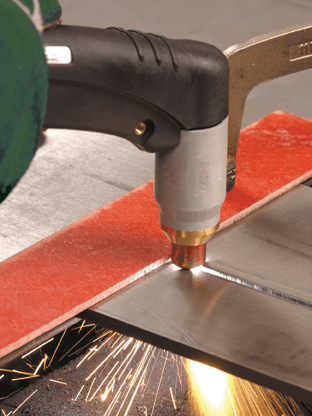 All CUTMASTER products provide “more punch” when needed, offering a maximum cut thickness that ranges from 60 to 150% greater than the recommended cut. CUTMASTER products eliminate the concept of having to “buy up,” or purchasing a machine larger than end-users actually need. CUTMASTER 52: weighs 43 lbs. and provides a 1/2” recommended cut at 25 inches per minute, which is 25% to more than 100% faster than competitive models. It delivers a 1-1/8” maximum cut and offers the industry’s only 60-amp drag tip. Users prefer drag tips for cutting light gauge metal up to 1/4” thick because they produce the best cut quality and narrowest kerf width. CUTMASTER 82: also weighs 43 lbs. but provides 80 amps of output power for a 3/4” recommended cut (1-1/2” maximum cut). CUTMASTER 102: the fastest 1” cutting machine on the market today, it cuts 1” steel at 13.5 inches per minute. It wWeighs 62 lbs. and provides 100 amps of cutting power and delivers (1-1/23/4” maximum cut). 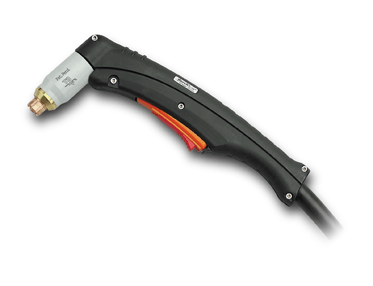 CUTMASTER 152: weighs only 62 lbs., offers multi-voltage single or 3 phase input capability, and but provides 120 amps of cutting power for a 1-1/4” recommended cut and 2” maximum cut. All these power sources come standard with a 4 year warranty, feature a roll bar that provides easy transportation and protects the front and rear of the power supply for unmatched durability, and come with all the benefits of the 1Torch®: versatility, flexibility, performance, convenience, and multiple application range with fewer consumable parts required . 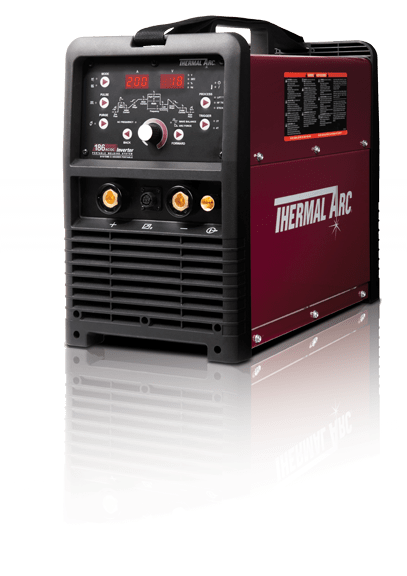 The Thermal Arc 95 S weighs 9.7 lbs., measures about the size of a lunchbox and uses 115V household power to provide 90 amps of Stick welding output at 20% duty cycle. While extremely compact, the 95 S uses inverter technology to provide positive arcs starts and stable arc performance. It can weld with 6011, 6013, 6014 and 7018 electrodes up to 3/32” diameter. 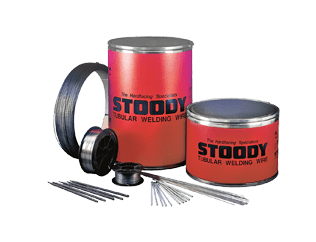 The Stick welding package provided as part of the offer includes the 95 S power source, Tweco WeldSkill style electrode holder and ground clamp with 10ft. leads and 20-amp adapter plug and cable. 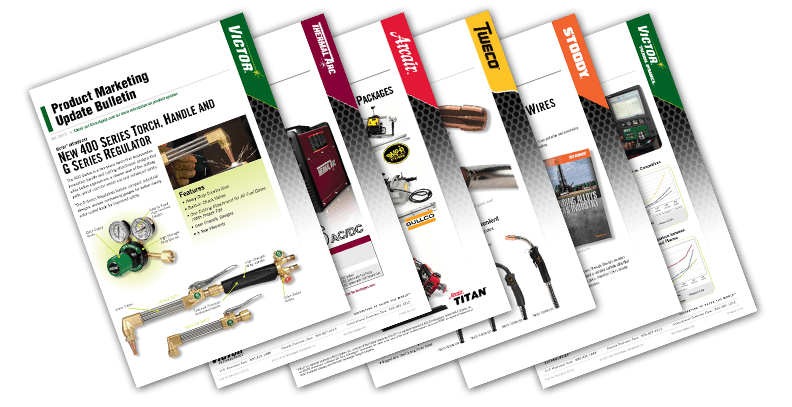 The 95 S can also DC Lift TIG weld at 95 amps (20% duty cycle) when paired with Thermal Arc’s 17V TIG torch and argon regulator (each sold separately).